Full of fresh, tangy flavor, fried green tomatoes are the soul of the south. Paired with our exceptional Organic Multigrain Bread with Ancient Grains this is a sandwich made for the gods. 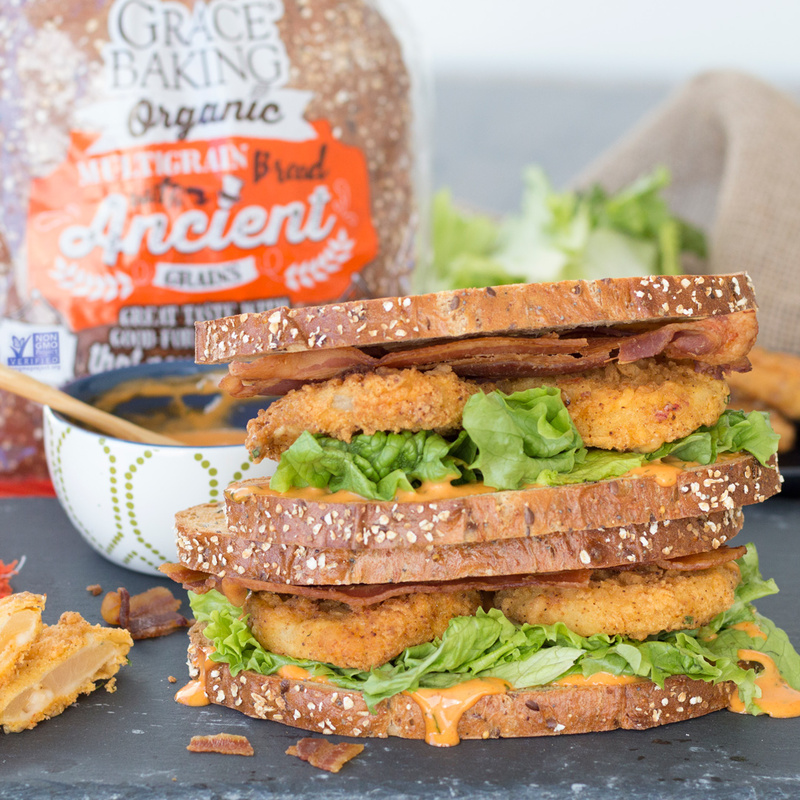 The BLT is true sandwich royalty – and when you double down on delicious with the authentic southern taste & tradition of fried green tomatoes, it puts the garden-variety BLT to shame. It’s a triple-decker taste adventure, and an entire loaf could conceivably serve an army, or at the very least tempt one into unconditional surrender. Slice tomatoes approximately ½-inch thick. Whisk egg and milk in a small bowl. Pour flour onto a small plate. On a second plate, stir together cornmeal, breadcrumbs, salt and pepper. Dip tomatoes in flour to coat, then in milk-and-egg mixture, then in cornmeal mixture to completely coat. In a large skillet over medium heat add one ½ inch of cooking oil. Once hot, add tomatoes and cook until golden brown and crispy on both sides, flipping intermittently. Do not let tomatoes touch while frying. Once both sides are golden and crispy, remove from oil and place on a paper towel-lined plate to drain. Make the spicy mayo. Mix the mayonnaise with chili sauce and lime juice. Add cilantro to taste. Build sandwich. Spread spicy mayo on one side of each slice of toasted bread. Layer two slices with lettuce, fried green tomatoes and three slices bacon each. Top each with remaining toast slices, mayo side down, and enjoy.